New? Join us. Already a member? Join us or send in your cheque. Change your community with actions, NOT just words! It's simple. You join us right here on this website and make a commitment to donating $100 4 times in that year. When you sign up, you nominate a charity. Then you stand by your commitment shoulder to shoulder with other local women...attend the meetings and bring your cheque! It couldn't be more simple. 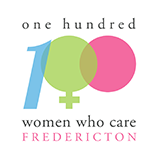 100 Women X $100 = $10,000 in real money to a charity in our own backyard!